‘Have You Met Miss Jones’ is written in the key of F Major and is usually played at a fast tempo. The tune was originally written by Richard Rodgers for the musical comedy ‘I’d Rather Be Right’ and has since been recorded by many of the great jazz musicians such as Art Tatum, Hank Jones, Kenny Barron, Chet Baker and Oscar Peterson. 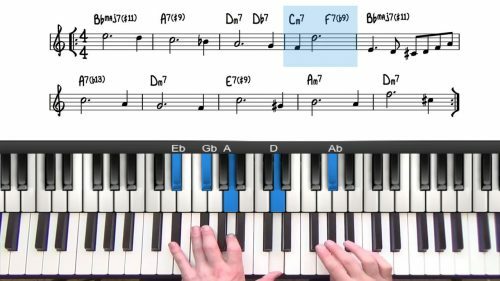 The chord changes weave through many different keys particularly in the B Section which contains back-to- back 251s in Bb Major, Gb Major, D Major and then back to the tonic key F Major for the final A section. The tonal centers of the 251s in the bridge move by major thirds which is said to have served as inspiration to the jazz saxophonist John Coltrane, in the development of the ‘Coltrane Changes’ which follow the same harmonic pattern. These chanes can be found in many of his tunes — ‘Giant Steps’ and ‘Countdown’ being two of his most famous compositions. 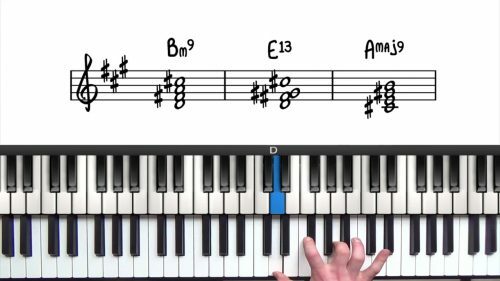 We start the tune with left hand voicings and the melody, and then the second time through we’re going to keep up the fast tempo but add some more interesting voicings, chord substitutions and rehamonisations. 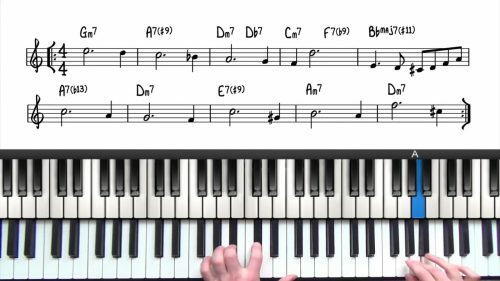 First learn to play through the form with left hand voicings. Then move onto the 2 handed arrangement. This jazz standard has been widely recorded so make sure you are listening to the records for additional inspiration.